Go to System settings > Internal users or System settings > External users, depending on whether you want to delete an agent or an artist account. Here you will find an overview of the active user accounts. 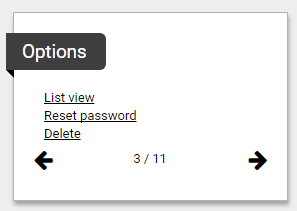 Select the user account that you want to remove and choose Delete from the Options menu. When you delete an internal user account, you should move the ownership of records in System One to another existing user. This moves any open tasks and ownership of bookings and documents to the selected user. When deleting an internal user account, no data records such as contacts, bookings and/or documents will be removed from the system.